I’ve had a few requests for a post on how to start baby-led weaning lately, as I’ve been sharing some of our journey over on my instagram, so I thought I’d put something together that is based on my personal experience of baby-led weaning, what’s worked for us and how we’re doing it right now! PLEASE NOTE: I am not a doctor, a health professional or a baby-led weaning “expert”. I am a mum who successfully used baby-led weaning with my first child and is in the midst of it now with my second. Baby-led weaning is essentially giving your baby bits of regular food and letting them give it a try, feeding themselves! So not worrying about purées or mashing or baby rice etc. Here’s a great resource that tells you more about it. For me, I feel that its made my children less fussy with food, really enjoy meal-times and it was a lot simpler for our babies to be able to join in mealtimes with us and just have a bit of whatever we were eating. I was never organised enough, or had enough time to purée foods and freeze blocks of mush etc, so it suited me to be able to give my baby something wherever we were and not think about preparing separate meals. My toddler now sits with us at the dinner table, on holiday, in restaurants and generally orders off the adult menu! Her favourite foods are olives, humous, spaghetti bolognese and this year, she even tried octopus when we were in Italy and didn’t bat an eye-lid (I, on the other hand, was gagging at the thought lol). 1. A lot of patience! Baby-led weaning is often a lot slower than feeding your baby purées as it takes them a while to get through chunks of food, it’s not quite as easy for them and you’re introducing new items slowly at first. Oo it often takes a bit longer for them to get onto three square meals a day. It can feel a but disappointing when you put a chunk of carrot or a slice of toast in front of your baby and they aren’t really interested, or they just have a little nibble and then move onto something else. And you might see some purée-fed babies demolishing a whole bowl happily. But that’s ok – neither is right or wrong, they’re just different and it’s okay to go at different paces too! Baby-led weaning requires your child to be able to hold themselves upright happily and they need to be able to reach out for food safely too. So a good sturdy high-chair, that you can strap them into is an essential. And for me, I love one with a big tray that you can just put food straight onto as there’s plenty of space for them to play around and experiment with their food. This Trio 3-in-1 SmartClean High Chair * is super cool (*affiliate link). If you’re worried about mess, stock up on bibs too! 3. A baby that is ready! What does this mean? Well, as I said above, the baby needs to be physically ready to wean – so sitting upright and holding their head upright happily is essential (so they can actually swallow and digest food safely) and showing an interest in food can be a good indicator too. How do you know if they’re interested in food? Well, you’ll start to see your baby watch what you’re eating and maybe even make a grab for your lunch! This is a really good indicator that they’re ready to try. This is usually around 6 months old but I know lots of people who’s babies have been ready around the 5 month mark too (and equally some a bit later). Have a chat with your Health Visitor if you’re not sure and don’t be put off if you try and your baby isn’t interested! Just try again in a couple of days. That’s it! That’s all you REALLY need. You don’t need plates, spoons etc, although they can be introduced for fun further down the line (more on that later!). Okay, so this is different for everyone, but I’ve found slowly introducing one item of food a day for the first week or so, then increasing to two items for the second and third week worked well for me. Then when I was confident there weren’t any allergies or any causes of concern, I was more relaxed with introducing meals and essentially anything appropriate that we were eating. What do I mean by appropriate? Nothing with alcohol, too much spice, salt, sugar, fat or oil in. Keep it clean eating! ALLERGIES: If you have an allergy or are worried, consult your Health Visitor and/or GP before trying those foods. don’t worry about mess! It’s inevitable and it’s fun for your baby. It’s part of the process of discovery and they love it. don’t worry if you miss a meal or have a bad weaning day. Sometimes your baby might be too tired, poorly or you might just be too busy to focus on weaning that day. That’s ok – just make sure you keep their milk intake up! Don’t beat yourself up – just try again tomorrow. As long as your baby is getting the milk/nutrients it needs, that’s all that matters when you’re starting. mix and match! Baby-led weaning doesn’t mean you can never purée – just introduce the purées after you’ve introduced some solid foods so they get used to texture, chewing and the gag-reflex. I always have a couple of Ella’s Kitchen pouches in the cupboard for days when I don’t have much fresh food in! enjoy it! It really is one of the most fun parts of your baby’s growth and development – watching their excited little faces and funny expressions as they try different foods. if you want to introduce more fun to meal-times, then we’ve loved our Taf Toys Mealtime Monkey which you can play hide and seek with the food! don’t worry about gagging! Gagging is in fact a good thing! 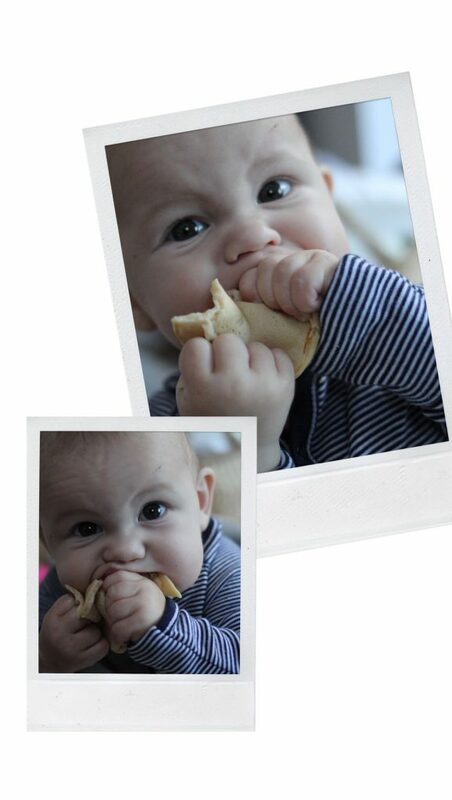 It shows your baby is learning how to move food round their mouth and that they need to chew before they can swallow. Remember, until now they’ve only ever swallowed milk, so it’s a different challenge for them. Gagging shows that their instincts are kicking-in so don’t panic. CHOKING IS VERY DIFFERENT! IF YOUR BABY GOES SILENT OR STARTS TO TURN BLUE, THEY ARE CHOKING! 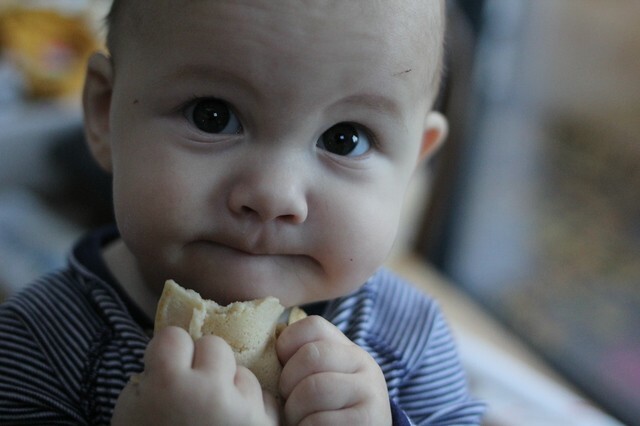 This is just how I started-off in my first few weeks of baby-led weaning. Some things my babies liked more than others. Some meal-times they seemed happy to eat away for 20 minutes and sometimes they just weren’t bothered at all. Just go with the flow, don’t worry and don’t compare! Your baby will get the hang of it soon enough. Enjoy! Head on over to my Parenting page to see other posts on my journey and experiences of motherhood.